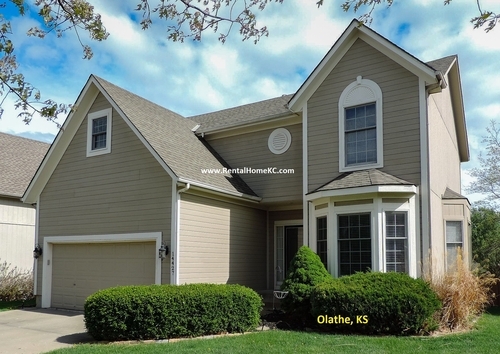 This roomy 2-story features a unique floorplan with very nice upgrades. All new paint and carpet in dining room and entire upper floor. The great room with a wall of windows overlooks a large deck. The great room, breakfast nook and kitchen are all one open space with hardwood floors. The kitchen is beautifully updated with white cabinets, stainless steel appliances including French-door refrigerator, and granite countertops. The main level also has a formal dining room and 1/2 bath. The upper floor includes the laundry room, hall bath, 3 bedrooms, plus large master suite with tray ceiling, separate tub and shower, double vanity and oversize walk in closet. The basement level has a big family room with pool table, bar, 1/2 bath and plenty of remaining storage. Beautiful fenced back yard. Great location near all the dining and shopping at 135th and Blackbob, just 5 minutes from I-35.